Last week I made my way back to Ottawa for a mini vacation to do some things that celebrates Canada’s 150th birthday. During my stay there I made it a point to visit the National Gallery of Canada. Surprisingly I have been to Ottawa on numerous occasions but this was my first visit to the gallery. I went there because they have a large selection of Canadian artists’ works on display to help celebrate Canada’s 150 and perhaps inspire me. I was not disappointed. In the gallery you can see may examples of Canadian artists’ works, from indigenous works to traditional to the Group of Seven up to the present. I also enjoyed viewing some international pieces from Europe and the US but my focus was Canadian artists. There were so many pieces to explore but I will limit this post to three that truly inspired and touched my soul. 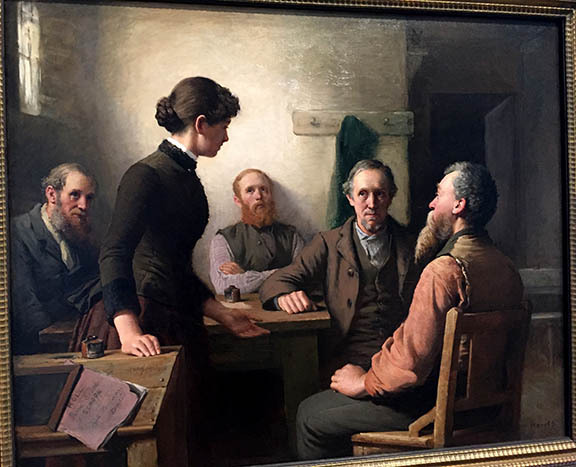 I decided to take a tour and one of the first paintings I say was by Robert Harris entitled “The Meeting of the School Trustees” 1885. When I saw it I immediately recognized it from an old Heritage Minute vignette. It was amazing to see this painting in person considering I have seen it on television in commercials as a child. 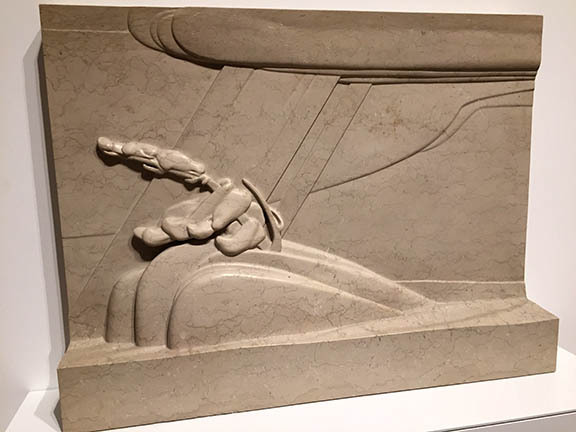 The next piece was not a painting but a sculpture by Elizabeth Wyn Wood entitled “Passing Rain” carved 1929. When I entered the room I immediately was drawn to it. It was very familiar and I learned from the tour that she was inspired by the Group of Seven depictions of the Canada’s natural landscapes and created something similar yet unique. When I saw it, it reminded me of the Art Deco style of straight lines and smooth cures. It truly is an inspiring piece. The third is actually two paints created by Christine Pflug entitled ‘Kitchen Door in Winter II’ 1964 and “Kitchen Door and Esther” 1965. These two painting were painted a year apart and was not meant to be a pair. Yet when I saw the first painting of the African doll and all the imagery around it being cold, dead and outside, I could not help but think of the civil rights movement. Some how this doll represents the African community being left outside, having barriers to overcome to come inside. Then in contrast the second shows a little Caucasian girl reading a book in a warm green open environment. I could not help but see that the artist painted the image with small clues of openness all around the painting. The opening in the trees to reveal the sky, the open book, the open door and the open cabinet door to the upper left. It almost suggests that this little girl has more opportunities that the other African doll would have. That society is more open for her. Experts don’t think that these paintings were meant as messages about the civil rights movement. Yet considering the imagery and they were painted in 1964 and 1965, right the middle of the movement, an argument can be made. There were so many different and inspiring pieces that I cannot comment on all of them, however, I was able to take pictures. Below you can see some other spectacular examples of both Canadian and international artists that is on display at the National Gallery of Canada that can entice the soul and inspire the mind.